ATC forums - View topic - Feeding separate Stereo and AV preamps into ATC AmpPacks. View topic - Feeding separate Stereo and AV preamps into ATC AmpPacks. Feeding separate Stereo and AV preamps into ATC AmpPacks. I would like to find an alternative way of enabling BOTH of the separate systems in my lounge....a stereo SPL preamp, and the 'front' outputs of a Naim AV preamp. to BOTH feed into the same ATC active speakers, without a switching system. I have found an item called a Combiner, intended for studio use, for example to feed two line level signals into a single mixing desk input, which seems to allow this to happen. It can also be used on stage when a backup amp can be connected in parallel to the main amp in case the first fails, and connected to the same speakers, will allow the proceedings to continue without issue. However, the combiner is intended to take 2 XLR balanced preamp outputs and combine them to a SINGLE XLR output. Obviously you would have one system turned OFF when the other is ON, BUT this way is apparently SAFE for the preamps, as it isolates each of the 2 XLR inputs from each other. So I have 2 concerns. 1. Is the sound likely to deteriorate when a Combiner is in use? 2. The Naim output is SINGLE ENDED so I can make up suitable cables but with a 'pseudo balanced' cable two of the pins in the XLR plug are joined together. Is this all gonna work, or is it a non-starter? 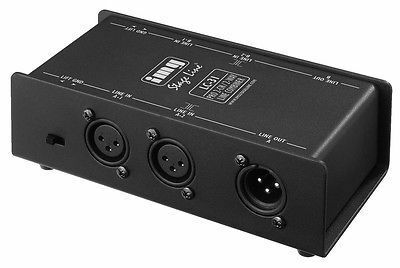 SOUNDCHECK 07/2007 on the FGA-102, FGA-202, LC-31, MC-31 and LSP-102: "Every musician or sound engineer should have these little helpers in their toolbox. They impress by their inconspiciousness. Both the robust metal housing and the functionality of these transformers allow to solve many problems on stage or in the studio at a reasonable price." Re: Feeding separate Stereo and AV preamps into ATC AmpPacks. I can't answer your question entirely, but I used to use a single ended arcam integrated as a pre amp into a Krell FPB200. I used cardas xlr to rca converters. They worked perfectly and solved a ground loop issue I had previously. I am in a fairly similar position to you. I run an Oppo 105 as a transport into a Benchmark DAC2 (DAC/Pre) for stereo............ and use an Integra 80.3 Pre/Pro for M/C. I simply run separate XLR I/C's to my SCM 70ASL's for BOTH............ and just swap one set of I/C's in/out at the speaker end as required. Both sets always remain connected at their output ends. In my case it's CARDAS Clears for Stereo and CARDAS Clear Lights for M/C. Considering you can only hear one Source at a time and one is off when listening to the other............there NEVER will be either!!! Heck.........even if it was ON it wouldn't matter!! Thanks for your reply, Linger63, you clearly have the same situation, and you have decided to solve your problem by changing cables manually. I want both preamps to connect seamlessly to my SCM150 Active ATCs. The AV preamp will then of course also supply a 3-channel power amp which will feed the 2 rear surround speakers and the centre speaker. 1. My current Panasonic AV Receiver has integrated power amps feeding a 5.1 speaker setup (4 old but wonderful Philips bookshelf speakers with ribbon tweeters for front and surround, plus a Linn centre speaker, plus a subwoofer. I am going to keep the SPL preamp for stereo duties, and the AV setup I am moving over to is a Naim AV2 and Naim NAP175 3 channel power amp. I am hoping to use a COMBINER to feed both preamp outputs into my ATC SCM150s. Clearly I will turn OFF whichever setup I am not using, but this should work without me needing to 'switch the ATC input manually' with a switch box or by changing cables. But I am also looking at some other possibilities. I put the same suggestion on the DIYAudio forum and am getting some alternative replies there, BUT...you guys know ATC, and I would be more confident with an answer on ATCForums! Can you run a "tape out" from the AV pre-amp into the Stereo pre-amp and just switch inputs on there ? OK, so the AV is going through two pre-amps , but the AV stuff is presumably a bit less critical on quality, even if it were detectable. tw99 wrote: Can you run a "tape out" from the AV pre-amp into the Stereo pre-amp and just switch inputs on there ? OK, so the AV is going through two pre-amps , but the AV stuff is presumably a bit less critical on quality, even if it were detectable. Yes, you are right, I could do that, feeding the FRONT outputs of the Naim into the SPL stereo preamp, but then I would HAVE to have both systems switched on to watch TV / Bluray etc. I could also do it the other way round, feeding the stereo signal from the SPL preamp through the Naim AV2's 'pass through', but that would limit me to 'unbalanced' operation, as the Naim is all single ended connections. So this is why I had decided to keep the 2 preamps separate and NOT feed one through the other, but somehow to join the signals or switch them just before the ATC speaker's Amp Pack input point. The main reason to keep them separate is to retain the simplicity of operation of the AV side for my family to be able to use. It would of course mean instant death to anyone touching my HiFi. I would strongly steer you away from that IMG box. It's transformer based, and good quality, clean transformers aren't cheap. Look for a passive switching unit instead, you might be interested in the Kramer VS-4X. Alexk wrote: I would strongly steer you away from that IMG box. It's transformer based, and good quality, clean transformers aren't cheap. The reason I was keeping clear of the Kramer box is because it is a physical switch....although I STILL might go for it. Remember that the secondary winding will still be in the 'direct' audio path though, and this will have a former made of XY metal which will in turn have issues with magnetic self-inductance. It's effectively like having a 'static' speaker voice coil in the audio path, even if there's nothing connected to the primary winding (input) of the transformer. And I'll write up the solution (if any) that I find which works! I guess the easiest way with your setup would be to contact SPL and find out the unity position on the volume control and use the pre-out for left and right from the Naim into the SPL pre-amp. I think the only alternative to "do it properly" would be to obtain a pre-amp with an AV by-pass / unity gain input or setting. This is how I have my system setup. I have a Mark Levinson pre-amp which you can set any of the inputs with unity gain. The main reason I bought the ML pre-amp was that it had two sets of balanced inputs and I could set one to unity gain. Not sure if my contribution helps or not. Providing only 1 pre is on at a time, this should work I think. Possibly,Matt, but doesn't the plug on the end of the Y see the impedance of both preamps at the same time, even if one is off, AND will it matter that each preamp output will also see the impedance of the other preamp? I really don't know how this would play out...What do you think? paul_riordan wrote: I guess the easiest way with your setup would be to contact SPL and find out the unity position on the volume control and use the pre-out for left and right from the Naim into the SPL pre-amp. I think the only alternative to "do it properly" would be to obtain a pre-amp with an AV by-pass / unity gain input or setting. This is how I have my system setup. I have a Mark Levinson pre-amp which you can set any of the inputs with unity gain. The main reason I bought the ML pre-amp was that it had two sets of balanced inputs and I could set one to unity gain. Hi Paul. Any suggestion is helpful because it all adds to the info available. I would need to put the stereo signal from my SPL preamp through the unity gain bypass of my AV preamp. The problem with using a Unity gain input on my AV preamp is that my Naim AV2 unit is single ended, whereas the SPL output is XLR balanced. They can't (as far as I know) work together. I'm not sure to be honest. I guess that if there is a relay or switch in the path at the pre amp that is off, then the signal will only go this far, meaning the pre that is in use will only see the extra impedance of the cable and possibly a little of the other pre. I did once run 2 sets of xlr's off my Dac/pre(wired into one xlr at the Dac end) so I could feed the ATC's and a sub with the same balanced signal. This worked just fine.